I have recently done some work in order that the Phasmid Study Group website can display the information it contains much more neatly. 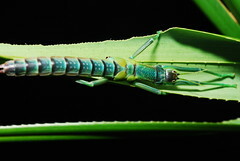 You can see this by going there, browsing to a stick insect taxon of your choice using the 'Species' taxonomy on the right, and clicking the little blue cross next to it. It also now gets content from other sites, including the Biodiversity Heritage Library, Google Scholar and flickr. As a first test I clicked the blue cross next to 'Phasmida' and found this fantastic looking species of Megacrania!